VERICUT 8 features several enhancements designed to increase the ability of manufacturing engineers to analyze, optimize, and document the CNC programming and machining process. Intelligence gathered from both the cut part and the machining process is applied to achieve an even higher level of accuracy and efficiency. 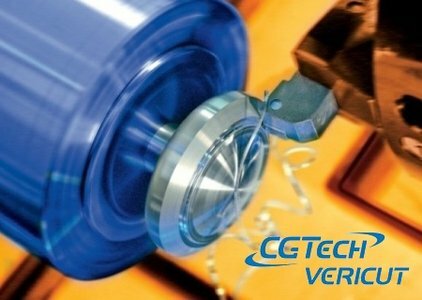 CGTech is increasingly challenged to simulate more complex processes and machines, while supporting "first part, good part" production goals. VERICUT 8.1 ties complex processes together with the ability to monitor and evaluate many potential problems in an efficient and consolidated method, thereby reducing the time spent in the programming and machining cycle. VERICUT 8.1 optimizes workflow and helps you find the functionality you need with minimal mouse clicks. Upon upgrading to VERICUT 8.1, the first thing you will notice is the new Ribbon Bar. The Ribbon Bar allows you to quickly select the VERICUT function you want to use. As you move from tab to tab, the Ribbon bar dynamically updates to show the options available for that tab. Options are grouped by the function they perform within VERICUT. You now have the ability to optimize "Air Cuts Only" (off-part milling cutter motions) as a capability included with VERICUT’s base Verification license. The new method is intended as an easy-to-use, entry level method of optimizing NC programs. Additional optimization strategies are available with the purchase of OptiPath or FORCE. As with all software programs, the accuracy of the data input will directly affect the output. So, an accurate model of the cutting tool and holder is required for the effective and accurate simulation of the machining process. Most leading cutting tool manufacturers now make 3D solid model data available and VERICUT can read in this model data for use in the simulation process. Many of the 3D models are available via the Machining Cloud App, and version 8.1 has been enhanced to take advantage of more Machining Cloud metadata. This can significantly simplify the configuration of tools for use in VERICUT, and better describe their proper use and limitations. VERICUT also integrates with most major tool management systems. Pre-setting suppliers including Zoller and Speroni can also interface to the software, so tool offsets and exact dimensions can be applied to the simulation session. A new preferences dialog allows users to setup many default settings that help to streamline creation of cutting tool assemblies. For example, you can specify the colors used, and the driven point offset numbering scheme (default to "1", or follow the tool number), and CAD model tolerances for cutters and holders, and if holder is desired (or not) for a new tool. Each imported 3D tool model can also have its own separate model tolerance. For example, you may want a very high accuracy on the cutter model, and less tolerance on the holder model. Version 8.1 Tool Manager has a number of other time-savers, such as being able to mark any tools as "Default", to be the starting point for building similar tools of that type, instead of starting from scratch. There are also a number of Copy/Paste/Multi Select improvements. – Translate models via selecting solid model features, eliminating the need to create coordinate systems for positional information. – Enhanced modeling options provide greater control and flexibility over moving individual models, assemblies, and component origins, greatly reducing time to model machines, especially from 3D CAD model assemblies. – New method to compare the stock cutting position to a 2D DXF file drawn for design. – Launch WinTool interface from within Tool Manager. – Windows 10 is supported. – Self-guided training sessions launch from the welcome screen and automatically open the associated sample files.